Discussion in 'Downhill & Freeride' started by 4130biker, Apr 23, 2013. Anyone have time on these? I'm interested to know what they ride like. The lack of grip while hiking sections of trail here in the PNW could be scary/hilarious and I wonder if the trade-off would be worth it. Interesting idea, though, seems like the shoe could engage in more pins most of the time, so maybe less crazy pins would be needed? Cali shoe. NC pucker factor would be crazy high when wet. Walking on FiveTens always makes my knees hurt. The overkill of grip makes it feel like walking down a slope. I have literally heard it all now. Maybe you can get some banana peels to walk around on. Looks like the MTB equivalent of the minimalist running shoe fad. Offer less shoe, charge equal or higher prices! Ever tried it? Walking, or running, on 5Tens? ^ Funny because if anything was a fad, it was shoes designed by mr Knight that actualy damaged knees. Minimalistic shoes are where it's at! Read Born to Run. But they should be cheaper, you're right. ^ Quite sure 5.10 is still made in 'merica. Of the 3 pair I have 2 were made in china (impact and chase) and 1 was made in Korea (spitfire). ^ Might just be their climbing shoes then. My bad. Some trails around here it's best to hike up, or at the very least to take another shot at a section. I'm thinking with our slimy mud, where hiking up can already be a challenge, this design won't be as good as having tread, but it's still interesting, because the trade-off could be worth it..
Its funny that this brought up barefoot shoes, since riding in running shoes illustrates the fact that contact patch on a pedal is probably almost as important as rubber compound for grip IMO. Gotcha. Yea after rugby in highschool, my knees would hurt running untill I gave flat shoes a go. And now since everyone is buying them, they have no reason to reduce costs. Annoying to spend over 100 on a pair of flat slippers, essentially. what do they offer that regular soles do not? I have ZERO complaints from either of my two pairs of 5.10s and the several pairs of pedals I've tried them on. The only thing I can think of that even remotely needs improvement would be velcro vs. laces and the ability to reposition your foot easier, which I can't imagine would be helped by having even more surface area in contact with the pedal. I dont quite get the rationale for putting the stickiest rubber in the new Freeriders 0_0 Dubbed MI6 from the movie, its even stickier than the 'stickiest' Stealth formula (Steath HF/Mystique) used in their climbing shoes. If we're filing complaints about current 5.10 riding shoes, I would like to complain about the lack of a Jesus sandle version of the impact! PS- i think the solid/flat shape would offer a bit more concistency in feel and perhaps a bit more grip to the pedal, and of course I'm speculating here. Would love to try these if they put a shank in the sole or whatever it is that makes Impact stiff. Vital just posted a review of them. 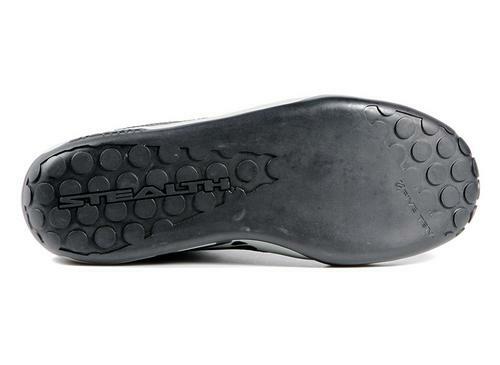 I like the new sole design, I currently have the BMX 5-10s but I'll give these a go as the next set of riding shoes. Hmm, that just might work. You guys know that a mold fee is a mold fee regardless as to how much tread there is on it, right? You could make it hyper-aggressive or pancake flat and the mold would cost virtually the same... In fact, if it's a new mold compared to the old one there's design costs, actual mold fees, etc, so the shoes could cost 5.10 even *more* than just the normal Impacts (rubber molds aren't cheap, *and* you need a poopload of different sizes, usually around 12-13 different molds). And doubt that there would even be any material savings in reduced rubber usage, so basically these probably have a higher factory cost than the Impacts. I have some 5-10's that are worn out in the new bald spot, $80 and they are yours. ha, so they do exactly what i wanted! That's pretty cool. I'd still like to see a more technical shoe with something other than laces but that's pretty exciting. It's good to see them continue to develop and invest in their mtb shoe line after it died back in 98 or whatever. Tying shoes is so 2008. I don't like them because there's one more thing to flop around, only this time it's attached to your foot next to a spinning chainring. I haven't had a problem on my 5.10 impacts or rennies, but if I were designing an improvement to a shoe, I'd include some sort of cover like the karver or strait up velco/buckles like a moto boot...but that's just me. ^ Velcro sounds good. Theyve been doing that in their climbing line for what, 20 years? tbh it is sad that there is not more hapening with fiveten since they have been bought by adidas. My elderly uncle had a stroke in the 80's and he has to wear velcro shoes. I could get you guys some of his old ones and you could resole them with 5.10 soles! Size 11. Let me know. mid/hi top shoes ftw.. never really had high tops (only mid top loteks), but the difference is night and day. the insides of my ankles thank me everytime i put on my mid top shoes and go ride. My elderly uncle had a stroke in the 80's and he has to wear velcro shoes. Velcro, buckles, or BOA closures are featured on the highest end road, mtb clipless, motocross, and moto gp boots or shoes. i carry Sam Hill shoes, perfect for DH. Indestrustable Built like a tank. Also Dirt Jump called Baggy, much softer and flexier and it has Velcro! Would love see VTX with some innovative lock like Dainese stuffs or Snow sport.